I hope you had a great weekend. We spent some time at the Four Seasons in Palm Beach celebrating our 7th Anniversary. The room and service were exceptional. I can get used to someone bringing me cold towels and frozen grapes while I lay on the beach anytime. Well, sleeping in the luxurious bed they had to offer, with an enormous down comforter, I woke up HOT. It got me thinking about how this happens to me often. I got home and checked my comforter/quilt to see what material it was made of, and had an aha moment....100% polyester. It's an oven cover. No wonder there is no circulation going on while sleeping. We keep dropping the air and it is currently at 67 at night and we still wake up hot. I had been wanting a new comforter/quilt and I guess now I NEED one, of the 100% cotton variety. I have been eyeing some of the quilt/comforters at West Elm and could not justify the purchase, so I waited. Well, I'm off to West Elm today to do a little shopping. This polka dot one is on clearance. I think I saw it at the store last week (none left online). It looks comfy and fresh, which is exactly what I want. I'm not worried about the South Florida winters getting too cold, I can always just throw a throw (hmm) on top for those 2.2 cold days we get. I can't believe I never noticed what material our comforter was made of. Silly me. Check Homegoods and Marshalls/TJMaxx too for all cotton bedding. They sometimes have nice options for great prices. We have two cotton blankets from West Elm that we love. We switched last year for the same reasons and it was great move. 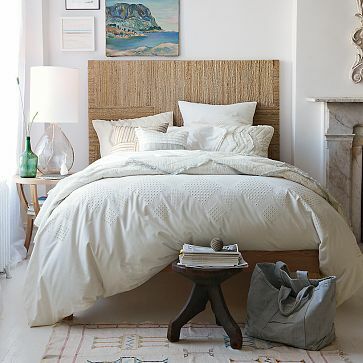 we have a cotton one from west elm and it is soooo comfy! my favorite cover i have had yet! have fun shopping- can't wait to see what you get! we've had the same epiphany this summer.. cotton did the trick for us! Happy anniversary! It seems like a lot of people had their anniversary last weekend. I've never paid attention to what our comforter is made of, either. Interesting...I don't think I've ever thought to look at the fabric content of mine either. Too funny, yet so true! And what a nice getaway for you guys - sounds delightful!